PTSuks Uncanny World: Max Payne 3 This Weekend - 3x XP Skulls For Everyone! WOOT! Max Payne 3 This Weekend - 3x XP Skulls For Everyone! WOOT! By popular demand, the first Max Payne 3 Social Club Multiplayer Event of our Winter Calendar is a weekend affair - taking place this Saturday, December 15th from 11am to 2pm EST (4-7pm GMT). So put any holiday shopping plans on hold for a few hours weekend warriors and pick up those dual M10s to battle it out in our live-streamed event along with other members of the Rockstar Games community. You'll also get to bask in the warm glow of TRIPLE XP all weekend long - and as a special bonus we're unlocking the fearsome Human Skull mask for all Social Club members. Now your opponents will have to face the Grim Reaper dead in the eye as you attempt to put them six feet under. As long as your platform ID is linked to your Social Club account, you'll find this awesome new skull is already unlocked in the Head Items section of your Multiplayer Loadout. Also, rally the troops from your favorite user-made Crew for this event, as we're rolling out new Crew leaderboards and unlocking the Wedding Skull mask for the top 10 user-made Crews on each platform. Please take note that this only applies to user-made Crews, so active members of top public Rockstar Crews like the Payne Killers and Read Dead Rustlers will not appear on the leaderboards or receive the Wedding Skull. Crew leaderboards and Wedding Skull masks will go live at noon ET on Monday, December 17th and once we release the skulls they will only be available in your Loadout when you're actively repping that top 10 Crew. During the event our team of Rockstar Dev players will be live-streamed on the Social Club Multiplayer Events page alongside our official hosted chat and sweepstakes - where you can enter to win one of five Rockstar prize packs. As with all of our Max Payne 3 events we will be posting player leaderboards after the event so you can see how you measure up against your rivals. Also, don't forget to check out our third bonus stream on the twitch.tv/rockstargames page, where we also host weekly impromptu playsessions and our ongoing series of Dev vs Crew challenges. Enter to win a Max Payne 3 prize pack on the events page, including a Max Payne 3 t-shirt, bullet keychain and stickers. Five winners will be randomly selected. Official rules can be found here. If you're unsure of when the event will begin in your time zone, have a look at the countdown on the Social Club multiplayer events page. 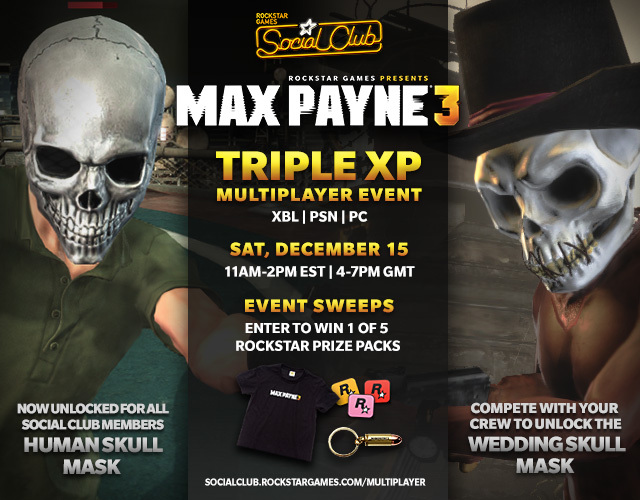 When the event starts up on Friday, enter Max Payne 3 multiplayer and select the Social Club Multiplayer Event playlist. We'll play a mix of Soft Lock and Free Aim, so look for the names listed above. We receive many requests from players who wish to play with our Devs, and we do our best to accommodate them all. During the event, our Devs will jump in and out of different lobbies to get a game with as many different fans as we can. If you can't get in a game with our Devs immediately don't forget to remain patient and make sure you get out there and represent for yourself and for your Crew. If you want more time to play our games with us, your best bet is to follow us at our official Facebook,Twitter, Google+ and Steam pages so you can get the word when we're going online for some impromptu multiplayer. Can't wait to get started! See you all in game! Now where did I put those pillz pillz pillz!